For one of our sessions, our retreat leader laid out about 50 photographs of random life scenes, and asked us to look over the table and select one that grabbed us or related to our lives. We would then share how that photo spoke to us with our small group. I walked down the length of the table, not seeing anything that really jumped out at me. I prayed that God would speak to me through a picture, but it just wasn't happenin'—until I came to the very last few at the end of the line, which is SO God. He always seems to make me wait for answers till the very last minute. 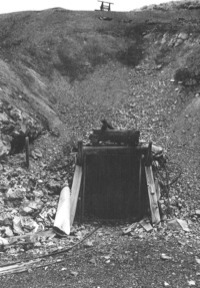 The picture was a mineshaft descending into darkness in the side of a hill. The hill itself was barren with lots of rubble and rocks around it. It grabbed me by the throat. I took it back to my small group and shared with them how the picture gave voice to things in my life. Desolation and Rubble. For the last 10 years, my life has been marked by a season of desolation—heartbreaking situations beyond my control along with much loss. There are many times I feel so barren and leveled to ground zero in my life. Not to say that I have given into despair, because I haven't. I still have hope and peace in my life, thankfully, because of my utter dependence on Jesus. But still. Many prayers are not yet answered, many pieces of my puzzle have not been placed, many hours are still spent in fasting for the promises that have yet to be fulfilled. So I fight often to stay hopeful and positive out there in the rubbly desert, waiting for my Promised Land. Dark Mineshaft. I'm not happy in the dark. I'm not necessarily afraid of it, but I'm suffocated by it, and I'm definitely afraid of what might be in it. When I saw that mineshaft in the photo, I knew exactly what Jesus was saying to me. "You and I must descend into the dark mine together—that's where the gold and treasure is buried." I have mentioned many times that I feel fearful and overwhelmed at times about the plans God has for my future. I believe they are WAY OUT OF MY COMFORT ZONE, because they are. I am not able, in my own strength and abilities, to do what God has asked me to do. I often focus on myself and my inabilities, instead of looking at my God and the possibilities. I wrestle with unbelief! This call out of the comfort zone thing the same for all of us. You cannot surrender your life to God for His amazing purposes unless you are willing to be yanked out of your comfort zone and into the dark impossible recesses of who knows what? But—the gold and treasure are down in that darkness of the unknown of God's will. He's not asking me (or you) to go in there alone. I forget that sometimes. He's asking me to take His hand and let Him guide me to the treasure. There is no other way to the gold except through the dark unknown of His will. The Gold and Treasure. These are the amazing, beautiful rewards I will experience when I surrender and believe, following Jesus into that cavern. It's the joyful, peaceful satisfaction I will experience for trusting Him. It's seeing the miracles and impossible dreams come to life when I focus on His power and not my weakness. It's the lives I will impact for the Kingdom through my testimony and faithful obedience. Remember this: The treasure is always, always worth it. It is TREASURE, for Pete's sake! Men have devoted their lives to backbreaking, dangerous labor, and they have even lost their lives, all in order to descend into gold mines. Why? Because the treasure is worth anything they have to put up with to get it out. Jesus asks me to trust Him until we reach it together, and to keep my eyes on the prize. Let's Go! One thing I've noticed—when I'm walking with Jesus in the dark, it's never as scary as I made it out to be beforehand. He's the perfect gentleman. He clears out the big hairy spiders ahead of me, He tells me when to lift my feet over the rocks. He tells me when to duck for the overhangs. Jesus can see in the dark. He will never, never leave me alone in there when I'm searching for His treasure. And you can be sure He won't fail. I'll be hitting gold before the journey is over. Informative summary, saved the website with hopes to read more information! I got from here regarding the matter.